Raising the bar once again Strike King adds to its Rage Tail line of soft plastics with big attitudes with the new Rage Swimmer. The Rage Swimmer is a ribbed, paddle tail swimbait ideal for numerous applications. 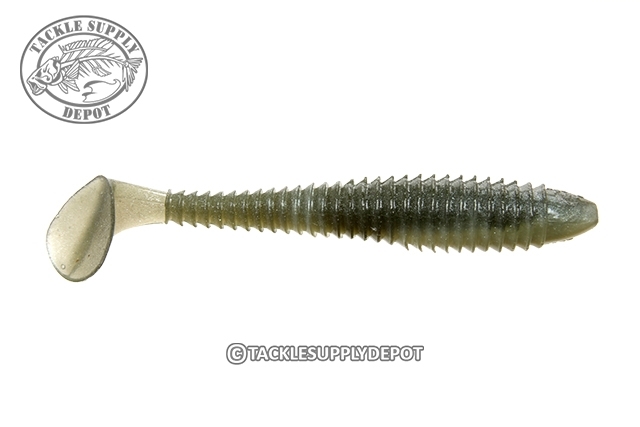 Pair with a football jig head for slow rolling rocky structure, rig with a belly weighted EWG hook for burning shallow flats, setup on the Strike King Tour Grade Titanium Umbrella Rig for a schooling action or flip around flooded cover with a Slither Rig Punch Weight; The Rage Swimmer is ready to take on whatever it is faced with. Each Rage Swimmer is made of a super soft plastic formula that provides ultimate movement while retaining durability. Forward facing ribs along the entire body grab water for additional water displacement while the paddle tail kicks effortlessly providing a natural swimming action that draws hunger predators in. Finally the coffee scent and salt infused plastic keeps fish holding on. Offered in an array of proven colors and multiple sizes perfect for many conditions the Rage Swimmer is sure to be a familiar sight on the tournament circuit and local ponds alike. All Rage Tail baits are packaged in individual clam shell packages to hold its shape until use. This means higher quality and NO deformed bodies! !